Visitors to our new Dorothy and Artie Fabergé Gallery display a wide range of reactions to our collection; some smile, others gawk, some stare with glittering eyes and a few let out a high pitched squeal of excitement. Despite the variety of expression witnessed in reaction to the exhibit so far, relatively few have remarked on how well lit the displays are. It’s a small detail, but museum geeks like me are accustomed to standing in darkened spaces, squinting at delicate antiquities bathed in only the softest light. This is because light is bad for any organic substances for a number of reasons, some of which are described in this interesting article from the National Gallery Of Art. Some light, like ultra violet light, causes chemical reactions to the surface of objects while other forms of light can simply heat objects ever-so-slightly causing damage over time. Although most of the objects in the Fabergé Gallery are composed of inorganic substances such as precious metals, gems and enamels, there are several very rare photographs, as well as pins and other accessories featuring cloth. 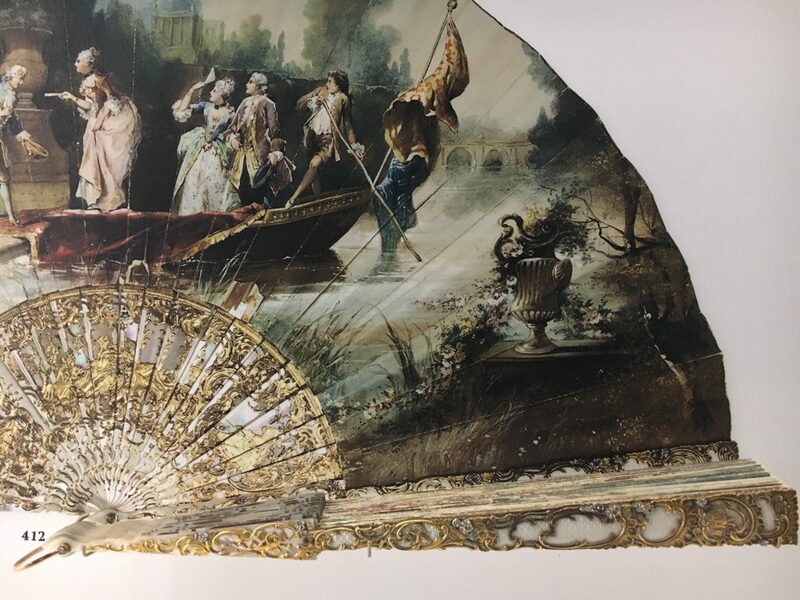 Walking through the Gallery, a perceptive visitor may notice that some cases are slightly dimmer than others, and a very perceptive visitor may notice something unusual about our magnificent display of turn-of-the-century Fabergé fans. These are just some of the precautions taken to ensure that our collection remains beautiful for a long time to come.